This post is one in a series showing you the main features of the GSM /GPRS/GPS shield and of its related library. The examples are great to have inspiration and reuse the material to create your own solutions. We already talked about how to use the shield to make calls, send DTMF tones and check whether the sender of an incoming call and command was in the trusted phonebook. This is possible thanks to the call.h class contained within the call management library. Here we will show you few examples about how to deal with SMS management. The sms.h file, shows you how to send a text message in correspondence to a particular condition or how to extrapolate the content of a received text message and how to interprete the commands contained within it. Let’s start from a sketch that can be used to send a text message to a preset number in case an alarm condition is happening. This example is similar to the one we shown regarding placing calls, it has been obviously tweaked to send a text message instead of placing a call. In this case, the triggering condition is reached when the Arduino board reads an analog value that is below to one that has been preset as a threshold value and the notification is done by sending a text message. The first parameter contains the message recipient, while the second one is the string containing the message body. In this way the string “Hello world” will be sent. In this example, in addition to sending the static string containing the warning message, we’ve also chosen to communicate the value that triggered the alarm condition: we must therefore transform the analog integer value read from the converter, in a string to be concatenated to the static one. where base is usually 10 since we work in decimal base. If we were to work with numbers in different bases we just need to change this value as appropriate. As said in the previous post, it is highly recommended to set a hysteresis or a low-pass filter to avoid repeatedly sending text messages in the case of oscillations around the threshold value. In case you wish to add a message to communicate the return to the starting condition, you just need add the following piece of code before the update of the value_old variable. Let’s have a look to the sketch used to interpret the commands received via text message. We’ll check the status of a digital output by sending simple text messages to the shield. Will be possible, therefore, to give the Arduino some remote commands, by simply sending a text message. which returns an integer containing the position of the first unread message. If no new messages are found it will return 0. To analyze the content you need to ‘open’ the message and read the contents. The GetSMS function takes care of reading the message in the position shown and to save the sender number and the message body (up to a maximum of characters as indicated by the last parameter). Once this is done you just need to control the text of the message to interpret the commands that have been sent. First, we’ll verify that the password is contained in the message body (the password used in the examplse is ‘testpwd‘). To do this we’ll use the strstr(char* string, char* string2) function that checks if the second string passed is contained within the first, returning a pointer to the first character of the substring. In case the substring is not present, a NULL pointer will be returned. Let’s recall that if(p) is equivalent to writing if (!=NULL). At this point, when authentication is done, as done previously for the password, we’ll check the presence of predetermined command strings. Once we’ve got the message, we’ll proceed with the interpretation, by enabling or disabling the output. As previously mentioned, we can provide authentication also by checking the sender. In the same way as, in previous examples, we checked whether the sender of an incoming call was authorized, you can do the same operation with SMS sender. Saving the trusted contacts on the within a specific range of the SIM will be enough: we just need to check what’s returned by the function in which we pass the range using the last two parameters. In this case the authorized number is saved between position 8 and position 10 (both included) of the SIM. Thanks to the previous condition we will enter the routine associated with the condition in which the SMS is received from a trusted number. Using the substrings search function we will identify the command for the allocation of the states and then we will move forward analyzing it character by character and then setting the appropriate status to its output. In this example, the “LEDCONF0000” string, sent to turn off all outputs, is composed of the first part (LEDCONF) that relates to the command type (in fact we could send different commands within a single message) and by a following part containining 0000 as the states to be set on the outputs ranging from 9 to 12. Recalling that the search function, if successful, returns a pointer to the first character of the substring, you will need to move forward of a number of characters that is sufficient to reach the first value containing the information on the first output. We’ll do this thanks to the strlen(char* string) function that gives back an integer with the length of the string passed as a parameter. In this way the p pointer will refer to the first numeric character. will be sufficient to check if this is equal to 1 or 0 to activate or not the output to it associated with it. For your convenience we will put everything in a loop equipped with some diagnostic messages (not strictly necessary) sent to the hardware serial port. As we did before, at the end of the cycle we first delete the SMS and then add a a few seconds delay to avoid making continuous queries to the shield. In this last example we chosen to create a sketch using both the classes we created: that for the management of phone calls and that to manage SMS. Upon the reception of a call from a trusted number, the program will check the status of the inputs (digital ones have been chosen but you can be easily extend to analog ones) and will communicate this information through an SMS to a specified number. Since this sketch uses functions already explained in this and in the previous article, we will just post the code without explaining in detail each step. I am using the GSM shield sold by OpenElectronics and your code but nothing seems to work! I changed 6 arduino Uno and tried 3 different power supply units. Have you chose the soft serial? There are two jumper to select hardware serial or soft. Hello there,I try example2 and wrks perfect.But when ill try to change the pin number that i want to make HIGH, nothing happent.For example if I change pin13 to pin12 on pin12 i havent HIGH when I send sms.Any saggestions? Hi , I’m a beginner . I want to use your library without aurduino , in any avr microcontroller using available compilers . How can I do this ? did you implement something on atmega? I can send SMS messages but whenever I try and read a new SMS it doesn’t return the text message (it returns nothing at all). The GetSMS function returns GETSMS_OTHER_SMS. I know the message is on the phone as I can put the SIM in a standard phone and it shows up. Any ideas? I have the same problem, but when I active DEBUG it prints one message over and over again. Since I was only looking for one message thats always the first one. It contains settings for gprs. what programming tool is used in developing the program? Hello, I need some help please. I’m trying to get to work example 2 without success. I tried with a power supply of 12 V @ 1,5 A and the jumper are configured as software serial. Is it possible obtain a detailed step by step to check this shield and get to work example 2? Hi Boris, I tried example 4 too without success. The problem is I have no idea why doesnt work, there is no response from the shield and Arduino Uno. There is anything I can do in order to check the shield? There is a guide step by step in order to make work these shield with example 2 or 4? Merry christmas by the way!!! Check the power, the serial connection anche the library installation. The power supply is 12V 1.5 A. The jumper are configured as software serial. The library is OK and the compiler work fine, without errors. This shield came with a guide in italian, that I cant understand. How I can activate the DEBUG? and where I can see what’s happening. From the terminal you can see the debug. Hi Boris, Now I can see the debug in the serial monitor. I tried example 3, from call examples, and works very good. Hello, I’m a student and currently building my design project. I want to ask if i can use AT commands while using the library?. For example i want to check the battery level, I want to issue AT command to the SIM908 : gsm.println(“AT+CBC”). Is this possible? thank you. This post is very helpful, i’ve learned a lot. Firstly, I wanted to congratulate you on your wonderful posts, they are very clear and easy to follow! Secondly, I wanted to ask you a few questions. I have a customer who wanted to make voice calls from the location of its installation, in case an alarm happened. So I don’t need the ability to make a lost call, but to be able to perform a real conversation. 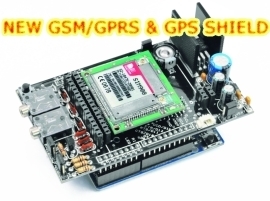 I understand that with the GSM/GPRS & GPS Shield and the SIM900 or SIM908 it’s possible, right? The Arduino can be powered to the installation’s power, but in case of power failure, they have to be able to make the phone calls, so it would be necessary to have the ability to be powered through an external battery. I understood through your post that this can only be done with the SIM908, did I get it right? And lastly, I read that the GSM/GPRS & GPS Shield is Arduino Duemilanove, UNO and MEGA compatible. Could you make a complete list of the compatible devices? Just to be able to choose the best one according to the installation’s requirements. With both SIM900 and SIM908 you can perform audio comunication, but only SIM908 includes can manage the battery. You can add an external battery to the shield but not controlled by SIM90x. The shield can be used with UNO, 2009, mega. We tested these devices. Great, thanks for your answer! I was thinking of buying the 1A lithium battery charging module with a Polymeter Lithium Ion Battery. I understand that this can only be done with the SIM908, right? But if I power my Arduino with the 1A lithium battery charging module and then the shiedl through the Arduino? Would I be able to use the SIM900 then? Are you using our shield? I tried to use the sotwareserial but it doesn’t work on Galileo. Hi, Are you using our shield? 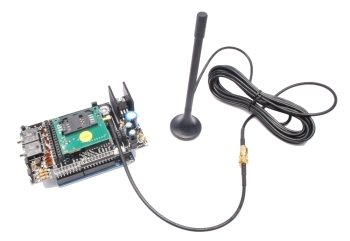 If a message is sent to a GSM module interfaced with a micro-controller through UART, can the information about the message (text, number) be read on the UART lines? Is it possible to wake the MCU after receiving any message? There is a function to get the Sender and the Message. Disconnect your gsm module with arduino and then upload the code. plz how u fix this error? I can not use the shield, neither the small breakout to send an SMS. the shield that works with this breakout. I checked the power on the shield and on the small breakout board and it is OK, 4.4 V.
Also I checked D3 from Arduino with an oscilloscope and everything looks fine. I checked the RX pin from SIM900 connector on the shield and also it looks fine ( half voltage compared with D3 ). The green led on the small break-out blinks for a while ( 1Hz ). But the SIM900 processor doesn’t respons in any way. No waveform on D2. No SMS :). And the current of the power supply? Hello Boris, please how I can pass the gsm.SimpleRead() to an string variable. I want display this value on lcd. Why am I getting this? right pin allocations and right volts and amperes. At first I used the readSMS commad and I did not get this from my serial monitor. It was able to go status=ready but keeps on complaining that I should use the GetSMS. When I used the GetSMS, this is what I got. WHY? I am getting the same serial output. Also, to change the pins in GSM.cpp, I opened that file in dev c++ and changed the pins and saved it. I got the same output too. I’ve followed every single steps with the help of youtube videos, but still no luck. Btw, i can use adruino mega without a problem. But my project need to use arduino uno instead. For uno check the setting beacuse Mega use the Serial Hardware and UNO the soft serial. Me too got the some output. i use arduino uno. however, i didnt face any problem when i use arduino mega. i followed all the steps provided. i use 9V/2A adapter. pls help me..my project is access control system,if un authorized entry is detected(by RFID & PIC),i just want to send a sms from SIM900A. how can i do it ??? you can use this function to send sms , its simple . 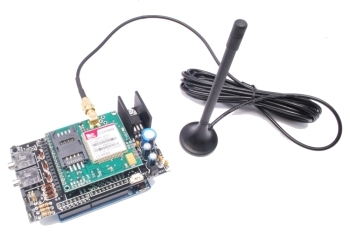 you need to connect your gsm modem with arduino via TX and RX pin or you can also use software Serial library for doing this . I uploaded GSM_GPRSLibrary_SMS.ino on my Arduino Uno. This method is deprecated! Please use GetSMS in the SMS class. And I’m not able to send any other commands. Any Idea? The GPS library is working well! Can Any one post the MikroC code for sim900a with pic16f877a to send message and recieve msg??? have you installed the library? Have you create a roght folder? Then tell me how it responds!! Hi!, so i want to send to multiple receiver. It’s possible to send in same time the same sms to multple receivers? How i can send to multiple receivers in the same time? where is the Library sms.h. means from where to download? On example 2, when i sends testpwd LEDON, it turns on, but when i sends testpwd LEDOFF, it doesnt turn off, and in serial moitor, no more NUOVO MESSAGGIO, POS=, and no PSWD OK, only at first message it works. hi sir,, it is possible to make one identified number and can disregard the unauthorized number ? can i save numbers in the arduino with only serial software library? How do i set phone numbers into a variable for multiple sim cards? ?is that possible? I’d like to use GSM/GPRS modules for some remote monitoring. The technical aspect is easy enough to understand, but do I have to set up an account for each module with a cellular service provider?